Intellectual disability is often overlooked within mainstream disability studies, and theories developed about disability and physical impairment may not always be appropriate when thinking about intellectual (or learning) disability. This pioneering book, in considering intellectually disabled people's lives, sets out a care ethics model of disability that outlines the emotional caring sphere, where love and care are psycho-socially questioned, the practical caring sphere, where day-to-day care is carried out, and the socio-political caring sphere, where social intolerance and aversion to difficult differences are addressed. It does so by discussing issue-based everyday life, such as family, relationships, media representations and education, in an evocative and creative manner. This book draws from an understanding of how intellectual disability is represented in all forms of media, a feminist ethics of care, and capabilities, as well as other theories, to provide a critique and alternative to the social model of disability as well as illuminate care-less spaces that inhabit all the caring spheres. The first two chapters of the book provide an overview of intellectual disability, the debates surrounding disability, and outline the model. Having begun to develop an innovative theoretical framework for understanding intellectual disability and being human, the book then moves onto empirical and narrative driven issue-based chapters. The following chapters build on the emergent framework and discuss the application of particular theories in three different substantive areas: education, mothering and sexual politics. The concluding remarks draw together the common themes across the applied chapters and link them to the overarching theoretical framework. An important read for all those studying and researching intellectual or learning disability, this book will be an essential resource in sociology, philosophy, criminology (law), social work, education and nursing in particular. Chrissie Rogers joined Aston University as a sociologist in the School of Languages and Social Sciences in September 2012. She graduated from Essex with her PhD (ESRC) in Sociology (2004) and then secured an ESRC post-doctoral fellowship (Cambridge). She subsequently published a monograph Parenting and Inclusive Education. Chrissie has held posts at Keele, Brunel and Anglia Ruskin. Chrissie has published in the areas of mothering, disability, intimacy, and sociology of education. She also completed a small piece of research with young disabled people on relationships, friendships and leisure time. Chrissie co-edited Critical Approaches to Care: with Dr Susie Weller and is editing a special issue for Sexualities on Intellectual Disability and Sexuality. Chrissie is also writing in the area of women in the academy, and co-construction of research with disabled people. 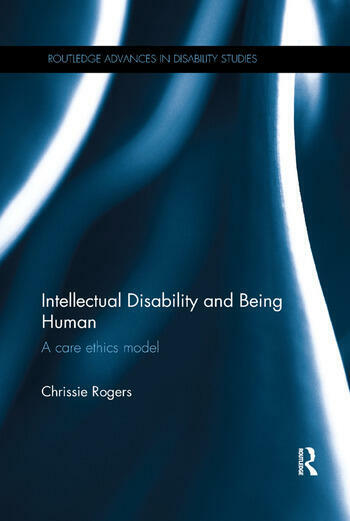 "Chrissie Rogers's Intellectual Disability and Being Human offers a unique combination of disability theory, care ethics, pop-culture references, and sociological insight. Combining these approaches is unique, and the task is enriched by Rogers's background in sociology and social theory combined with her knowledge of feminist philosophy. Rogers addresses some of the most significant areas of life related to care ethics, including education, mothering, and relationships. I recommend Rogers's text and I applaud her unique and well-researched combination of ethics of care, capabilities approaches to disabilities, sociological theory, and pop-culture references. It is rare that a book combines such careful scholarship and clear writing with an eye toward practical knowledge and making a genuine difference in the everyday lived experience of real women."